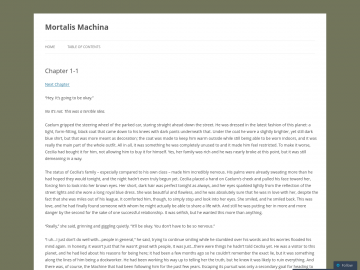 "&quot;The only salvation for the human race was through its own evolution, and gene-modification was the only viable way to accomplish that.&quot;"
Mortalis Machina by Connor MacDonald is a sci-fi novel updated weekly. Mortalis Machina has not been tagged yet. Help others find Mortalis Machina by tagging it! Mortalis Machina has not been reviewed yet. Mortalis Machina has not been recommended yet.